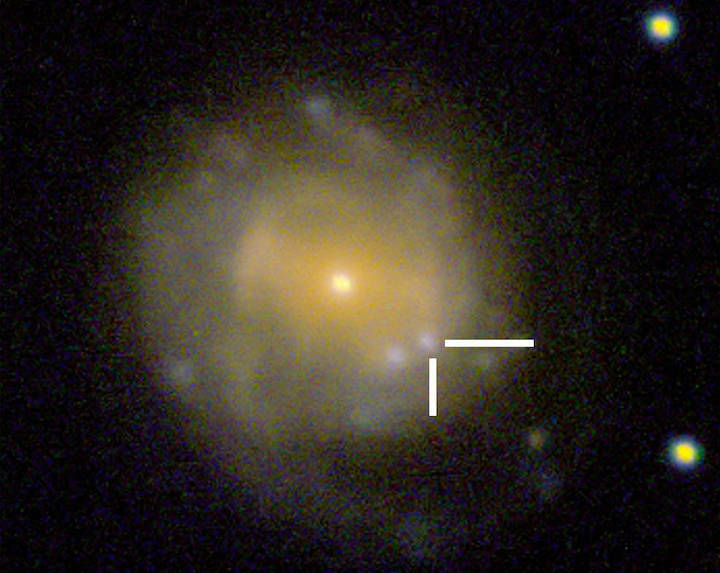 AT2018cow erupted in or near a galaxy known as CGCG 137-068, which is located about 200 million light-years away in the constellation Hercules. 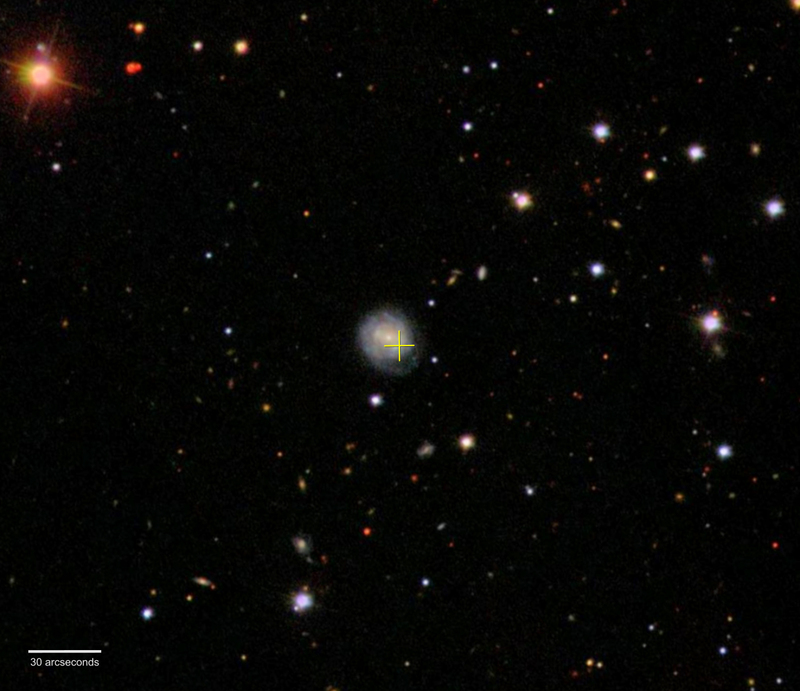 This zoomed-in image shows the location of the "Cow" in the galaxy. Watch what scientists think happens when a black hole tears apart a hot, dense white dwarf star. A team working with observations from NASA's Neil Gehrels Swift Observatory suggests this process explains a mysterious outburst known as AT2018cow, or "the Cow." 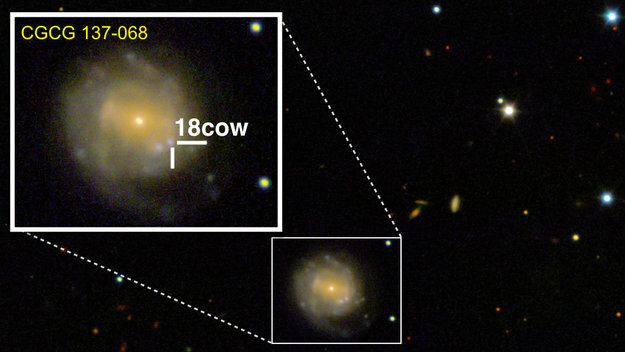 AT2018cow erupted in or near a galaxy known as CGCG 137-068, which is located about 200 million light-years away from Earth in the constellation Hercules. The yellow cross shows the location of this puzzling outburst. Astronomers using ground-based observatories caught the progression of a cosmic event nicknamed "the Cow," as seen in these three images. 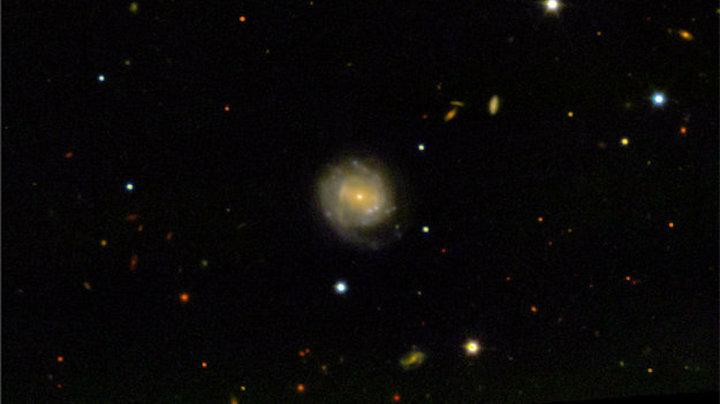 Left: The Sloan Digital Sky Survey in New Mexico observed the host galaxy Z 137-068 in 2003, with the Cow nowhere in sight. (The green circle indicates the location where the Cow eventually appeared). Center: The Liverpool Telescope in Spain’s Canary Islands saw the Cow very close to the event’s peak brightness on June 20, 2018, when it was much brighter than the host galaxy. Right: The William Herschel Telescope, also in the Canary Islands, took a high-resolution image of the Cow nearly a month after it reached peak brightness, as it faded and the host galaxy came back into view.